Osvaldo called us this afternoon with a report from Confluencia Camp. He said that the weather is simply amazing. Clear, stable with no winds, a bit cold at night, but warm days considering the altitude. The team left at 9:30 am for their acclimatization hike. 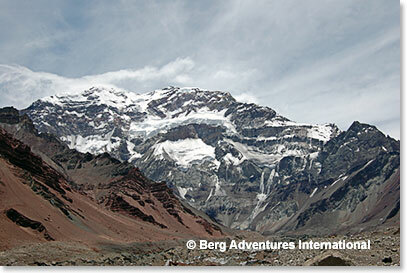 They reached a high point of 4000 meters (13,100 feet). Osvi was enthusiastic because he said they had the best views of the spectacular South Face of Aconcagua that we have had in several years on this hike. It is truly an awe inspiring view. The time of Osvi’s call was 3:00 PM and the team had already returned to Confluencia and had lunch - they are resting now. At 6:00 PM, just before dinner, we will have a routine check up by the Park Service doctors who are stationed at Confluencia. Oxygen saturations, blood pressure will be measured and the doctor will listen to each climbers lungs. If ok is given by the docs and the team still feels good tomorrow will be a big day! The mules will arrive for bags by 7:00 PM and the team will be off on the long hike to Plaza de Mulas. Good luck guys! We look forward to hearing how it goes.